I figured it was high time I got around to reviewing this book. I talked about the characters a while back during a Six Degrees Post, but I wanted to give this book and series a bit more attention. Especially since it ranks up there in my favorite books of all time. If I had to choose a favorite fantasy novel but was not allowed to choose any works by J.R.R. Tolkien or C.S. Lewis, this book would be the one topping the list. The Princess Cimorene has had enough. It’s bad enough that her parents put an end to her cooking, fencing, magic, and Latin classes, but now she is expected to marry Prince Therandil. It’s not that she has anything against Prince Therandil, really, but they have nothing in common, and Cimorene is tired of hearing about the sorts of things princesses should or should not do, simply because of what is traditional. But what to do? Cimorene is at a loss… until she meets a talking frog, who gives her some advice. Following his directions to the letter – Cimorene isn’t the sort of princess to rest on the bench she was told to avoid or eat golden fruit if she was told not to – Cimorene finds herself in a dark room surrounded by… DRAGONS! It is very unusual, a princess going to a dragon and asking to be hired as a cook and librarian, but Kazul is about as non-traditional of a dragon as Cimorene is a princess, so the arrangement works out quite nicely. But something else is going on near the Mountains of Morning where the dragons make their home. There are pesky wizards messing about, and it is certain they are up to no good. Can Cimorene and her newfound friends discover their plot and foil it in time? 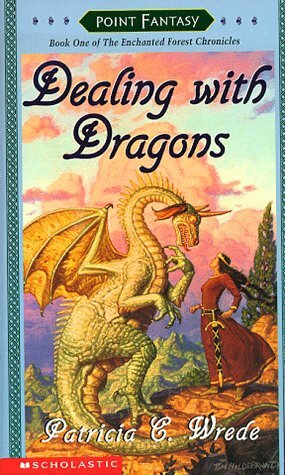 Dealing With Dragons is a delightful tale filled with adventure, humor, a quick wit, and plenty of snarky references to various fairy tales. I love how this book mentions the fairy tale tropes, and then bypasses them with a set of unique and quirky characters who absolutely refuse to align themselves with the stereotypes surrounding the roles their type of characters normally play. Cimorene is headstrong and tomboyish, but she is not disrespectful or angsty. She is practical, pragmatic, quick-witted, and quick to offer up alternative solutions when questioning the status quo. Likewise, Kazul is a dangerous, fire-breathing dragon who likes to carefully consider all angles and sides to a problem before breathing fire at it. The cast contains many other fun characters who refuse to be anything but three-dimensional, and you will love them for it. If there was a fantasy world I’d like to live in, this would be it. If there was a character I’d like to be best friends with, it would be Cimorene. I love this book for so many reasons, not the least of which is that it makes me laugh out loud every time I read it. This is not a “deep” story with all sorts of hidden meanings, life lessons, or nuggets of truth… it is merely an extremely enjoyable romp through a marvelously magical realm. It is a whimsy, a frolic, and if there is a lesson to be taught, it is simply this: that you do not have to be the person everyone expects you to be. Just don’t be a wizard. Because they’re the bad guys. I picked this up last year and for some reason didn’t finish it… I’ll have to try it again! Thanks for reminding me. It happens to be my partner’s favorite book from her childhood, too. Yes, I love the entire series, and Mendanbar!!!! Love him to bits! Must go change Tolkken-inspired typo now. MENDANBAR IS THE BESSSSSST!!! <3 ^_^ He's one of my very very very favorite characters EVER. This sounds like a wonderful series, Jenelle :). I will have to check it out! I sort of chuckled at the name of Princess Cimorene’s intended – Therandil – because I totally read it as “Thranduil” ;). By the way, I love the way you write your reviews. . . very well done indeed. Oh, thanks! That is so nice to hear, because I always get about halfway through a review and worry that I’m saying too much or too little, and then they just sort of end, because I never know how to wrap them up. I definitely write it “Thranduil” when I first typed it up and had to go fix it when Deborah pointed it out! ha! My 8-year-old son is in love with this book, with Cimorene, and with Wrede’s books in general. This was his favorite book for a long time, until he read Wrede’s “The Thirteenth Child,” which has since surpassed it. I’m really going to have to read it for myself one of these days. Definitely up there on my favorite series list… and favorite author! The Thirteenth Child was good, too.